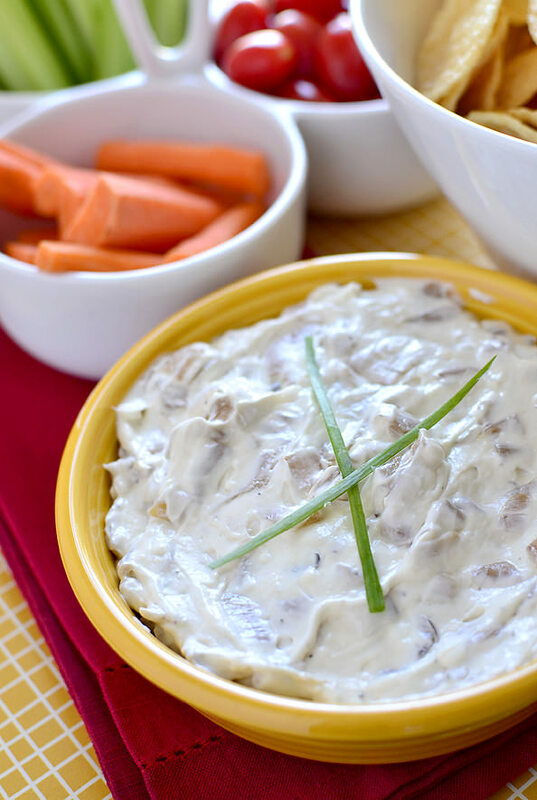 Best Ever French Onion Dip is creamy and decadent, yet easy to make. Serve with chips or crudite for a savory, satisfying homemade dip option at your next get together. 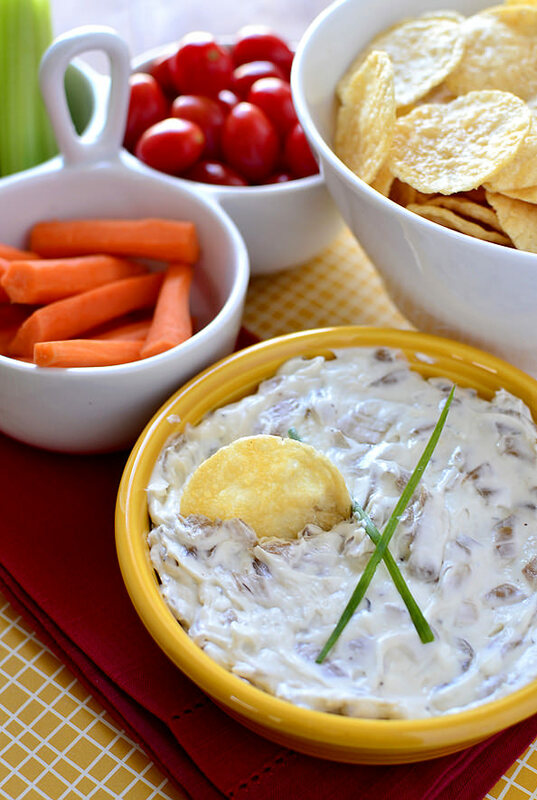 Oh boy, do I have a DOOZY of a recipe for you today – Best Ever French Onion Dip! As you may know, it’s March Madness, and college basketball games are currently being played nearly all day, every day (emphasis on the all day, every day part) on television sets across the country. Including mine. And probably yours. And if there’s one thing my sweet husband likes more than anything else, it’s watching said college basketball games all day, every day on our TV, God bless him. Anyway, if there’s one thing that can get me to settle in and watch teen athletes run back and forth on the same 94 foot stretch of court for 2 hours, it’s a good game-day dip to preoccupy myself with, which is why I created Best Ever French Onion Dip. 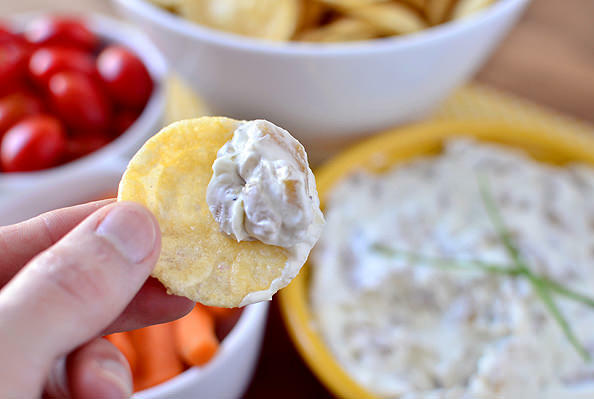 This thick and creamy, savory-sweet caramelized onion dip is perfect for digging into while watching the game at home, tailgating, and everywhere in between. Midwesterners: this dip tastes just like AE’s French Onion Dip, which, non-Midwesterners: is so good that I’d eat it with a spoon. This dip takes a little bit of time to make because of the caramelized onions, but it’s not hard, and can be made up to a few days ahead of time, as it just gets better and better in the fridge. It also tastes just as good with cut veggies, as it does with chips (or non-baked-nor-fried popchips, which is what I served it with!) 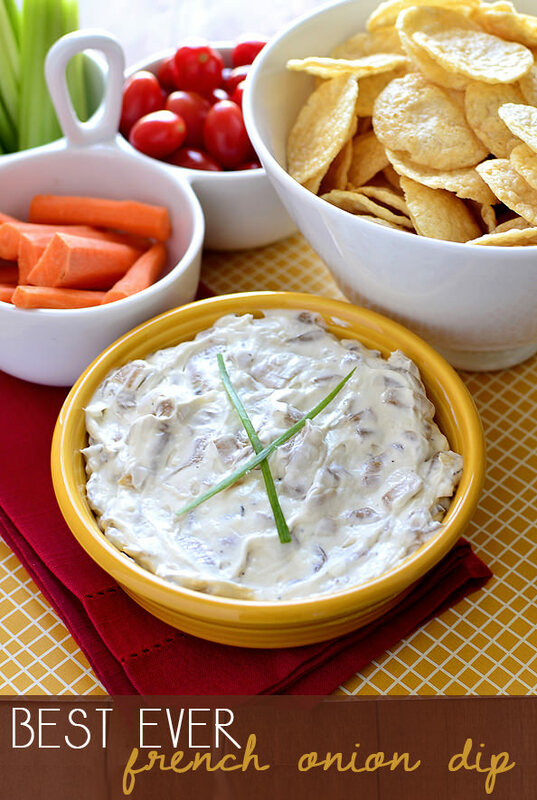 Whether you have a game to sit through, or a party to attend, you will definitely want to have this dip by your side! 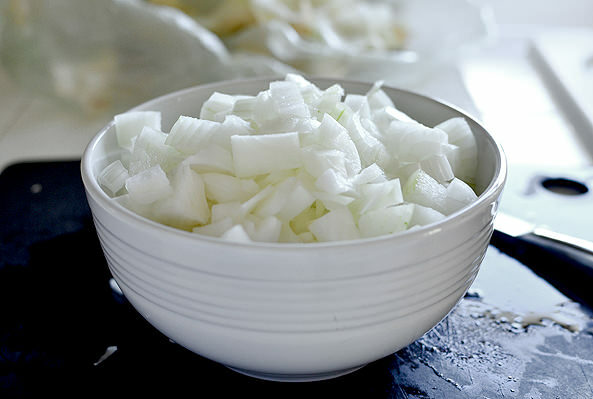 Start the Best Ever French Onion Dip with 2 large sweet onions. 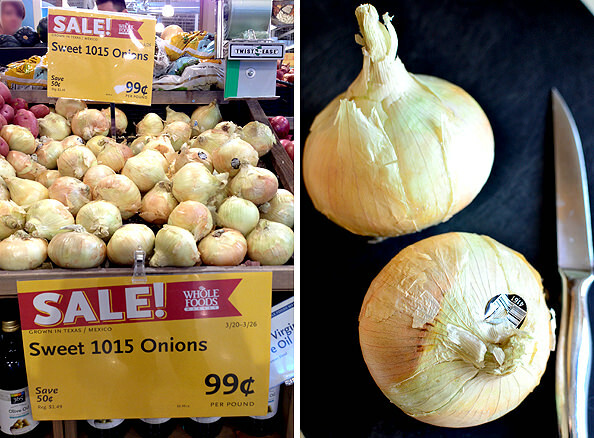 I found these Sweet 1015 Onions at Whole Foods, and they were amazing! Super mild and sweet. Next heat 1 Tablespoon each extra virgin olive oil and butter in a large skillet over medium heat then add the onions and season with salt and pepper. Stir to coat the onions, then add 1/2 cup beef broth and 1 Tablespoon Worcestershire sauce. BTW, this recipe is adapted from my French Onion Soup Potstickers, which also make great game-day eats! Next add 1 teaspoon sugar, and 1/4 teaspoon each dried thyme and garlic powder. and cook over medium heat until the they’re dark brown and caramelized – about 30-40 minutes – stirring occasionally. WELL WORTH THE TIME! Let the onions cool completely, then mix up the base of the dip. 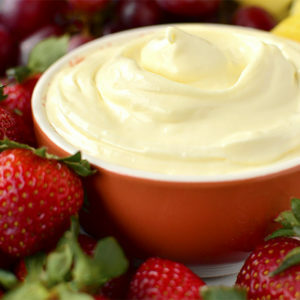 You’ll need 12oz plain Greek yogurt (2 small containers) and 8oz 1/3-less fat cream cheese. I love making dips with lighter Greek yogurt over sour cream or mayo, as long as there’s a slightly decadent ingredient like cream cheese to really tie everything together. Mix in a large bowl until smooth then fold in the cooled onion mixture. Note: caramelized onions are soft and not crunchy at all, but if you don’t like chunkier dips then feel free to pulse this in a food processor a few times to get it a bit smoother. Cut up some crudites and pour some popchips in a bowl, then serve! Heat butter and oil in a large skillet over medium heat. Add onions, salt & pepper, Worcestershire sauce, dried thyme, garlic powder, sugar, and beef broth then stir well. 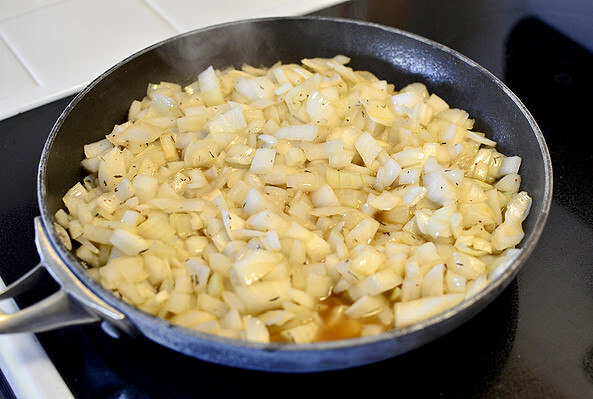 Turn heat to high and bring broth to a boil, then turn heat back down to medium and cook, stirring occasionally, until onions are very soft and dark brown, about 35-40 minutes. If onions begin to burn, turn heat down to medium-low. Remove onions to a plate or bowl then cool completely. In a large bowl, stir together Greek yogurt and cream cheese until smooth then fold in cooled onion mixture. Spoon into a serving dish then serve with chips and veggies. Like I said, this dip is just as good with veggies as it is chips, but I especially loved the crunch of these plain popchips I served alongside them. I was tempted to buy the sour cream & onion flavor to double up on da onion, but the lightly salted flavor was PERFECT! Whatever you choose to dunk with, and whoever you’re cheering for, I hope you enjoy! Just had to comment on the 1015 onions. Those are grown in my neck of the woods, the Rio Grande Valley! Even though I don’t live in TX anymore, it tickles me to see anything from our little corner of TX make it all the way out to the midwest! This dip looks tear-jerking good! :) I love pop chips, the salt and vinegar are my favorite. I made French Onion dip for the first time a few months ago and everyone went crazy for it! I like that you added beef broth & Worcestershire, and next time I’ll definitely use Greek yogurt to lighten mine up too! Mmmm I love a good onion dip! (definitely keeps me brushing my teeth though, lol) I’m excited for this giveaway! Popchips are amazing, and Jillian is AH-MAZING. I’ve never been a big dip fan but when I married into my husband’s family they made it very clear that dip is a must at any function. With that said, I’m pretty sure I can be made a convert with the addition of fresh caramelized onions. 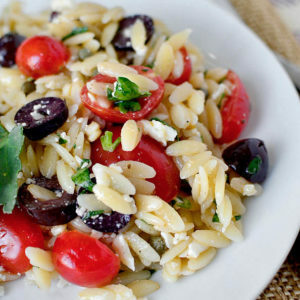 Cool recipe :) It seems like greek yogurt is being incorporated into everything nowadays! I never understood March madness until now! I set up brackets just for fun and now I’m addicted! Always checking my points and what place I’m in! Plus I’m always asking my fiancé now how points he has! LOL I highly recommend doing brackets next year, it will draw you in and maybe bring a little competitiveness between you and your honey :-) I will be making this dip for us next weekend, thanks for sharing! Sounds yummy. I love popchips btw. If this dip tastes like AE’s French Onion dip then it has to be amazing!! Awesome giveaway, too! Pop Chips are an obsession of mine :). O man I love pop chips!! Great giveaway! A homemade dip that tastes like AE French Onion is a must try. I’m the same on the whole not watching sports on TV thing…and of course everyone I know are huge hockey fans! I’ve tried a similar version of this dip before and it was alright, but looks like your addition of worcestershire, beef broth and spices would make it great! This dip is right up my alley! 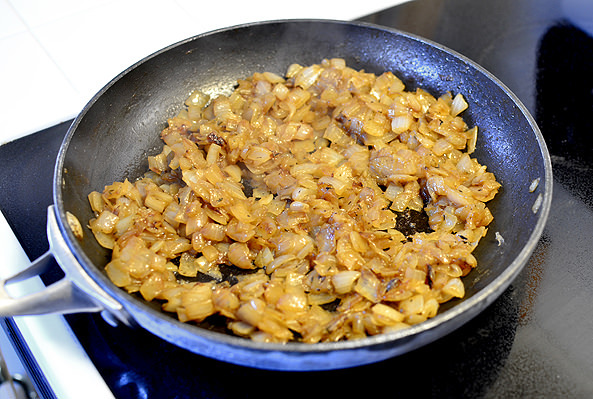 I love that caramelized onion recipe–must try it soon! I just about cried with joy when you said it tasted like AE’s French Onion dip. As a fellow Iowan, I have eaten that with a spoon. YUM! Can’t wait to try it! 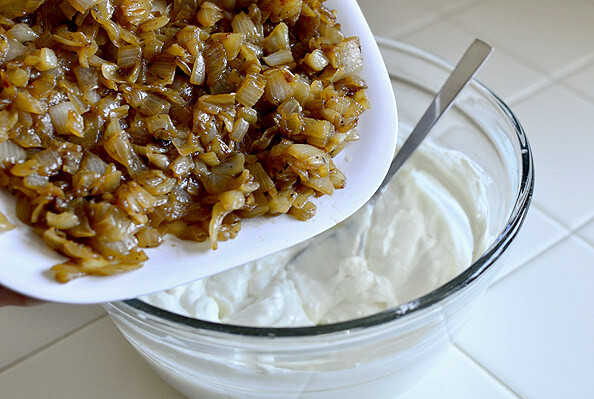 My recipe for French Onion Dip is sour cream with dry onion soup (MN style). Your recipe sounds delicious! But your comment on the squeaky tennis shoes on the court really hit home for me. My husband loves basketball – from way back when Drake was supreme. That loud squeaking drives me out of the room into the back where I can read something worthy – like the Shellseekers – a book I recommend for lovely pregnant women who need a fabulously good book about family and love. 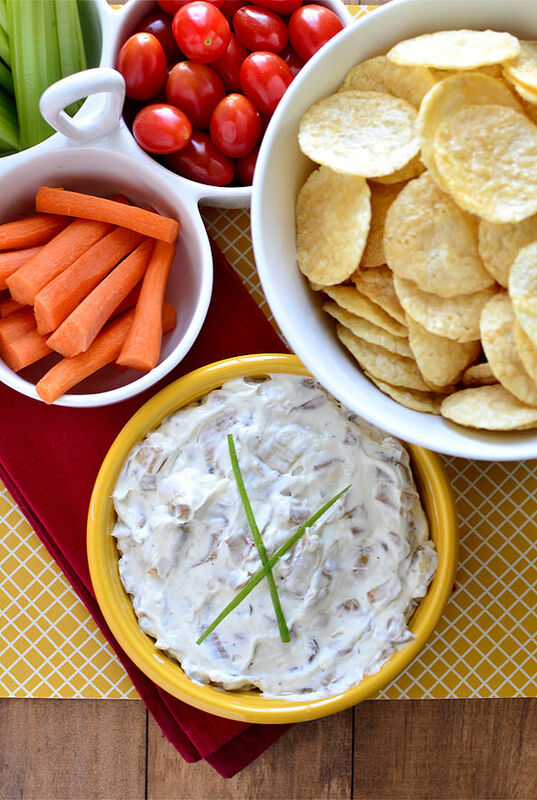 Onion dip = a good thing, no matter what is on TV! 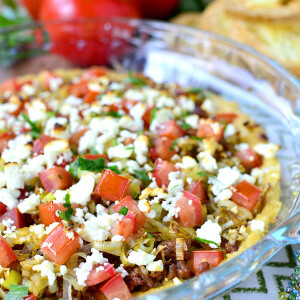 I am literally drooling over this dip! And I’ve recently become obsessed with Salt & Vinegar Popchips, which I think might make a pretty good match. We don’t have AE French Onion here in Wisco, but we have Dean’s which is ah-maaa-zing! I just recently discovered popchips, and now, I can’t get enough. Now I’ll have to try and dip them in this delicious sounding French onion dip! Your dip looks sooo good! This is awesome! I always make Guy Fieri’s french onion dip, which I adore- however, it is not so easy on the waistline if ya know what I mean! 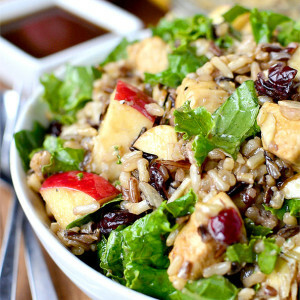 Thank you for the delish, healthier alternative… you are the best! Yum that recipe looks great! I’m currently reading Jillian’s book it is so good. Oh how I miss AE dips. Actually, I miss all of AE products. There is nothing like Midwestern dairy, beef, pork, chicken and the list goes on and on. Thanks for this recipe!! I can’t agree more! 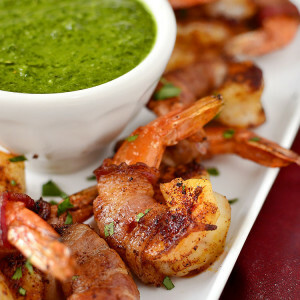 We are fans of guacamole on game day but this may have to be added for tomorrow. Thanks for sharing! YUM! This looks fabulous. I love popchips! AE’s French Onion dip is my favorite! Love this lightened version!! Omg, toooo funny: my husband is the same way and I always call it “squeaky sneaker time” because I can’t take the sound either! On a different note, this dip looks fab and may make the games more tolerable for me ;) Thanks! That dip looks delicious!!! 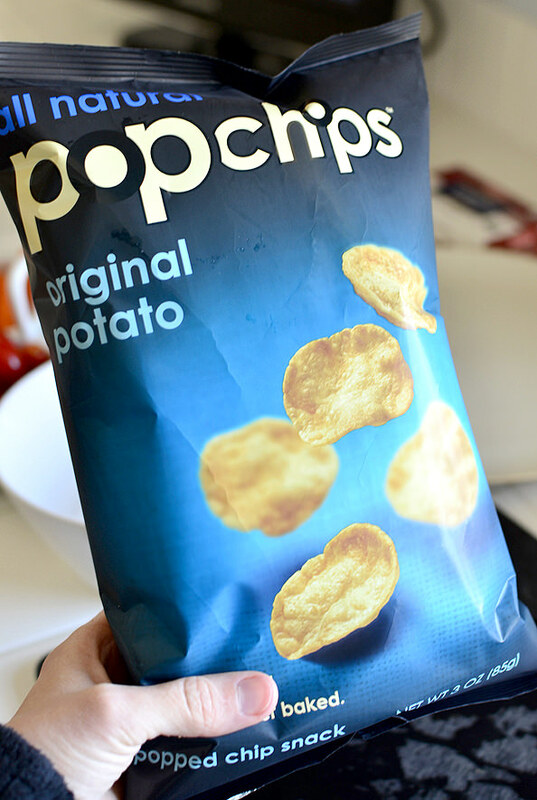 I’ve never had popchips, but have heard a lot of good things about them. Super excited you are giving away a SIGNED copy of Jillian’s book, Slim for Life. I’m a huge fan of hers and would be thrilled to win the signed copy! recipe looks AWESOME-thanks for the homemade option, as I have never been much of a fan of the “packet” kinds. :-/ Oh, and GREAT JOB on the EASY giveaway! Love the one click entry! 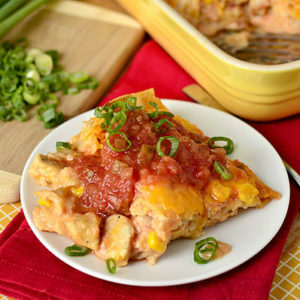 I love that you created a recipe without the msg packet. LOVE this stuff and have avoided it for a decade now. Thanks! Can’t wait to surprise my husband with it! Never have thought to make homemade french onion dip! Thanks for sharing!! I’m an Italian Girl Sooo A HuGe FaN of AnyThing w/ Garlic and OnioN in It!!. YuMmY..
Popchips are the BEST!! omg. Even my super picky husband loves them! pop chips are so delicious…my favorite are the Parmesan/garlic! I loooove Pop Chips. I love that one serving size is 26 chips. That is amazing. This dip cooks splendid. 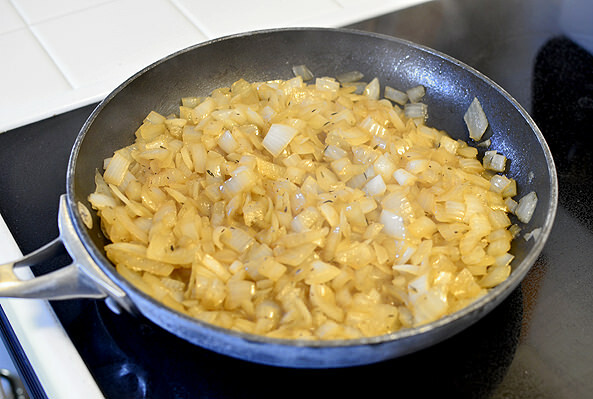 I love caramelized onions, they are totally worth the work. Dip looks fabulous…any idea how long it will keep? Would be good for card club some night…at least I would have 8 people eating then! That dip looks so great! 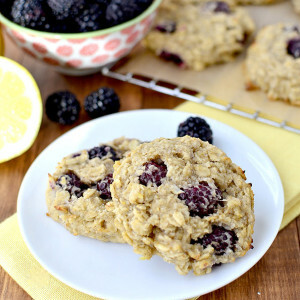 I also entered the giveaway – I LOVE Pop Chips, and Jillian Michaels – so it was just meant to be. I moved away from Des Moines when I was 25 (17 years ago) and STILL miss the AE French Onion dip — and Hy-Vee! :) Love reading your blog for many reasons, one of them being that it always reminds me of home. Thanks for this recipe — can’t wait to try it. I love that this is homemade. 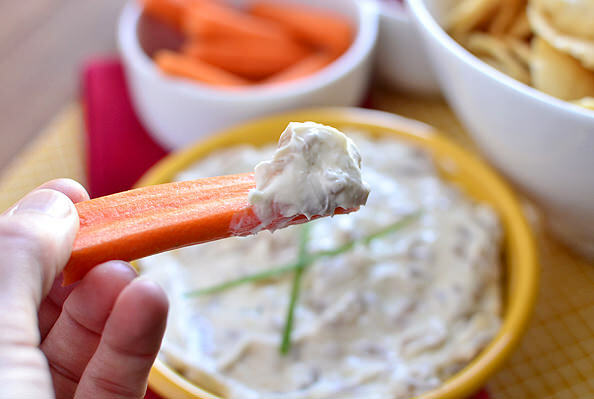 My favorite way to eat French Onion Dip is with pretzels! Popchips would fit nicely into the Weight Watcher’s points plan. The dip would be good too but definitely in moderation. Wow, what a dip! It looks so mouthwatering and perfect for dipping PopChips into! I just made some french onion dip myself! I used a food processor to smooth the dip out a little. It reminds me of a childhood snack! P.S. Love your addition of Pop Chips – so good!!! I love french onion dip, used to have it all the time. I will have to make this.